In the introspective lyrics that frame The Answer’s In The Question, a song on his album Face The Promise, Bob Seger reflects: ‘How will I be remembered? Will my critics be unkind?’. Seger has nothing to worry about. His track record speaks for itself. A 2004 inductee into the Rock And Roll Hall Of Fame, Seger is celebrated as one of rock’s most successful elder statesmen. A gifted songwriter, his work is beyond reproach. Just take one look at some of the numerous classic rock standards he’s written during his career: Ramblin’ Gamblin’ Man, Get Out Of Denver, Turn The Page, Beautiful Loser, Katmandu, Night Moves, Hollywood Nights, Rock ‘N’ Roll Never Forgets, Feel Like A Number, Mainstreet, Fire Lake, Against The Wind, We’ve Got Tonight, Her Strut, Even Now, Shame On The Moon, Understanding, Tryin’ To Live My Life Without You, Like A Rock… This man’s string of hits reads like the ultimate classic rock jukebox. Bob Seger is blessed with a soulful, whiskey-flavoured voice, his songs are spun like little movies, full of wide, sweeping vistas and colourful, small-town characters that come alive in the grooves. A consummate storyteller, Seger’s music resonates with authenticity, weaving all the flavours of Americana into a piquant musical stew. His impeccably crafted songs embody a decidedly American slant, drawing together weighty blue-collar struggles, ambitions, frustrations, hopes, heartbreak and dreams of the everyman. 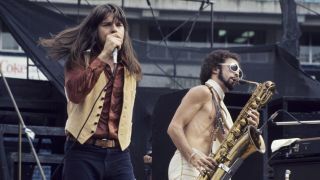 A native of Ann Arbor, Michigan, Bob Seger was kickin’ out the jams in the Motor City from the early 60s with such outfits as The Decibels, The Town Criers and The Omens. In May 1966 Bob Seger And The Last Heard’s first single, the local hit East Side Story, was released on Hideout Records. Having signed to Capitol Records in 1967, he slowly built a reputation for his incendiary live shows, Seger’s rep as a rising star growing through the heartland and bolstered by the No.17 placing of Ramblin’ Gamblin’ Man (also the name of his debut album), and modest regional hits. Bob Seger was the hardest-working man in showbiz, routinely undertaking a punishing tour of more than 250 dates a year. Although a succession of albums – Noah, Mongrel, Brand New Morning, Smokin’ O.P.’s, Back In ’72 and Seven – attracted little national interest , Seger wasn’t about to pack it in. He forged on, unrelenting in his drive to make it at whatever cost and whatever price. In 1976 fate smiled on this ‘overnight sensation’ that was more than 10 years in the making, and Seger rocketed to national stardom with Live Bullet, an explosive tour de force showcasing the commanding power of Bob Seger and his Silver Bullet band. Not long after Live Bullet resuscitated Seger’s career from extinction came a career-defining album. Night Moves, released in 1976, is a magnificent record that deftly illustrated Seger’s growing talents as a highly expressive and evocative songwriter par excellence, as displayed on the classic title track, the nostalgic home-town paean Mainstreet and the sweaty raver Rock & Roll Never Forgets. Stranger In Town (1978) and Against The Wind (1980) delivered on Seger’s creative and commercialpromise, resulting in more gold and platinum records and sold-out tours. Throughout the 80s and 90s he continued tocreatemagic in the studio with the albums Nine Tonight, The Distance, Like A Rock, The Fire Inside and It’s A Mystery. Fast forward to 2006… Face The Promise, Seger’s 19th album and his first new studio album in 11 years, is a confident and impressive return to form that ranks among the his best work. Mining a rich seam of rock, blues, country and funk, the album is an extraordinary 12-song cycle. The elegiac ballads Wait For Me and The Answer’s In The Question, down and dirty rockers Simplicity, Face The Promise and Between, and the Stonesy Wreck This Heart all demonstrate that Seger’s songwriting skills are undiminished. And proving that there’s some fire left in this 60- something, Seger is also hitting the road for his first US tour in more than a decade. Sitting at a makeshift table in the famed Capitol Records studio in Hollywood, in conversation Seger is a natural storyteller whose hearty and contagious laughter punctuates his compelling tales of more than 40 years of life in the rock’n’roll trenches. When did you realise that music was the only thing you wanted to do with your life? It hit me when I was really young. I remember in high school my best friends were so envious of me. They said: “You know exactly what you want to do”, and they had no clue what they wanted to do. When I was 15 years old I played my first gig at the junior prom. It was just me, a guitar player and a drummer; we had didn’t even have a bass player. I was the singer. You weren’t an overnight sensation, it took a good 10 years or more before you made it. What kept you going during those years? I had some small successes along the way, like Ramblin’ Gamblin Man, and then we had local singles that did well. We were able to play 800 to 1,000-seaters and fill ’em. So we were able to make a little bit of money. I just felt that people liked us. No matter where we played we never got a tepid reaction. I was always a high-energy act, and we rocked, and people that liked rock’n’roll liked us. We didn’t have the record company interest that we wanted. I guess at that point I wasn’t much of a songwriter because I played all the time; I didn’t have any time to write songs. I can’t tell you how disillusioned I got and how tired I got of not making it, but I never gave up. You built your reputation opening for the likes of Bachman Turner Overdrive and Kiss. In 73 and early 74, before we did the Live Bullet shows, so many of the opening acts we played with were so nice to us, people like BTO and Kiss. They got us on the big stages and we got our feet wet in front of huge audiences, and got used to the sound. Kiss were the nicest guys. They were fair. Even if they were running behind, they made sure we got a soundcheck, which was unusual. They were really, really good to us. I thought the Kiss show was really strong. I’m always still cheering for them, I’m happy they’re still doing well. I’ve always told anybody who will listen, from Kid Rock to The Eagles: you take care of your audience by showing up and you continually show up. And Kiss does that really well. They keep going out and people wanna see you, and if you show up they are so grateful. If you care about your fans and you show up, you’re gonna be beloved. I think that’s the way it is with Kiss. They’ve had that army since ’75 and they have treated them well. It’s a great lesson. A lot of people get big and don’t want to tour. That’s the wrong way to do it. Serve your audience. The record that broke you nationally was Live Bullet, which reflected what you did best. We were definitely a better live act than we were making records. Basically, Live Bullet, which was done in September 75 and came out some time in 76, was just the Beautiful Loser album live: Katmandu, Beautiful Loser, Travelin’ Man, I’ve Been Workin’ are all off of the Beautiful Loser album. We also did Ramblin’ Gamblin Man, Let It Rock and Turn The Page, which was from an album called Back In ’72. In 73 we did 265 shows. You play 265 shows in 365 days and you’re gonna be pretty tight as a band. When we finally hit at Cobo Hall we were snappin’ tight. We were ready to be heard as a live band. Live Bullet went platinum in six months. Then Night Moves came out about six months after that and they both went platinum on the same day. And suddenly we were off and runnin’. Knowing that you had a national audience at that point, as a songwriter did that give you more confidence? What it gave me was the ability to look at my record company and my manager and say: “Okay, we’ve reached this level. Now leave me alone for six months because I have to write good songs”. Not songs that I wrote on a bus or in a station wagon. I need to take my time and develop my craft. Seger: " I needed to take my time and develop my craft." Did your writing change from that point? I think so. Glenn Frey, who’d made it with The Eagles before Beautiful Loser, heard the initial tracks for the album. He listened to the songs and said: “Now you’re starting to write. Now you’re starting to get it”. He said: “Now you take your time. Take the time it takes to write good songs”. He was kind of my mentor, even though he was three or four years younger than me. With Glenn, the son became the father in a way. Seeing how hard Glenn and Don [Henley] worked on their stuff inspired me. Don would just kill himself over lyrics and Glenn would kill himself over music. Watching the two of them first-hand you could see how committed they were to their music. You co-wrote the Eagles’ Heartache Tonight. Yeah, but that was much later. Was there as much meticulous attention to detail going into The Eagles’ songs when you worked with them? Oh yeah. You listen to Don’s lyrics. He didn’t lighten up. You listen to the stuff they did in 1980 and it’s as good as the songs they did in 1975. Heartache Tonight started with me and Glenn at his house. I was playing bass and he was playing guitar. He had this little thing: ‘Somebody’s gonna hurt somebody.’ He wanted to write a shuffle. So we’replaying that groove, and Glenn’s singing the verses, and suddenly, out of the blue, the chorus came into myhead. [Sings] ‘There’s gonna be a heartache tonight, heartache tonight, I know”. I started singing that and Glenn goes: “Yeah!”. I took what he was singing about and jumped right into the chorus. Then Glenn called [Joe] Walsh. Now it’s like one o’clock in the morning. Walsh gets up and comes down and starts playing guitar on it, and comes up with the bridge. Then JD Souther came in right after Walsh that same night. He’d help Glenn with lyrics. The next day Henley chimes in and goes: “Oh yeah”, and he starts writing a lot of the lyrics. So that’s how that song happened. In your songs you often write about characters. What inspired that mode of writing? I think narratively I really admired people like Kris Kristofferson. You listen to something like Me And Bobby McGee and you know those characters, you know what they’re like. Or a song of his like Sunday Morning Coming Down. You know that those people are living the road life or living the blues. Of course Dylan was a huge influence on everybody. The Eagles: "It's a record about the dark underbelly of America"
Yes, later. What I really gleaned from Bruce was passion – just tremendous passion in his lyrics. You also get that from Henley and Dylan too. Bruce is a great writer. Back then Henley was a little unsure about Bruce, and we’re friends. I said: “Well, listen to this line: ‘They’ll meet ’neath that giant Exxon sign that brings this fair city light”, [from Springsteen’s Jungleland]. And Henley said: “Okay, I’ll buy the album”, I tell him the one line and he goes out and buys Born To Run. You’re renowned for being a very meticulous writer. How do you know when a song is done? Your song Night Moves could be a movie. It was inspired by the movie American Graffiti. It was all about cars and peg pants and rolled-up T-shirts with a cigarette pack up here and stiletto pointed shoes. That’s how I grew up, that was my high-school years. It was the easiest songin the world to write but the hardest song to finish. It took me six months to finish it. I had the first twoverses. Then I’m listening to Born To Run and I notice in Jungleland Bruce had a double bridge. I never thought of two bridges in one song. So I have two bridges in Night Moves. People at Capitol Records told me after they heard the song Night Moves that I had a ‘career record’. They said: “This is a song that you’re gonna have to play for the rest of your life”. With the Night Moves and Stranger In Town albums, did you sense that you were on a roll? Yeah, definitely. Plus I was always in contact with my best friends in music, The Eagles, and I’m hearing Henley’s writing and saying: “God, this is great!”. Then Leonard Cohen came along with Suzanne and all that great stuff, so I picked up on him. I’ve listened to Joni Mitchell since 67 when Tom Rush was doing her songs like The Circle Game. Then there was Paul Simon and so many other great songwriters. Those are my influences and my heroes and they all inspired me. On your new album, Face The Promise, some of the strongest songs are ones with the simple lyrics, like Wreck This Heart and Simplicity. These days is it easier or more difficult to write a song that pleases you? I think it’s always difficult. You can get technical enough to write a song relatively quickly, but finding the muse and the inspiration for something special, that’s so mysterious. You don’t know where it comes from. Having written so many great songs, do you end up throwing away a lot of material that doesn’t make the grade? Oh yes. I probably threw away 60 to 80 songs to get to these 12 songs on the record. Easy. I recorded 40 songs for the record. It could be my fault but I find I never get locked up if I finish everything. I know that sounds a bit over the top, but I’m a finisher. If I like anything about a song, no matter if it has commercial potential or not I will finish it. Sometimes in finishing a song, in the last verse you’ll come up with some great phrase that you can use in a different song if that song really doesn’t have any legs. And that’s how I pick ’em. The ones I pick are the ones that I still like three months later. I think Face The Promise is my best album in a while. I think it’s right up there with Against The Wind and Stranger In Town. Seger: "I tell Don Henley one line from the album and he goes out and buys Born To Run." When you’re getting ready to write a song, is it scary to sit down in front of a blank piece of paper? Not really. I guess because I wrote so much I’m not intimidated by it. The hard part is knowing when to stop. It really is. Tom Petty did an album several albums back, and he said he felt like he was overwriting things, and he decided the first version is gonna be the one he’s gonna use. I’m tired of killing myself overwriting. Sometimes it is the best version. Many artists lose the plot as they grow older but, like Tom Petty, you’re still writing great songs. It might come easier to Tom, but in my case it’s definitely hard work. I love all the stuff Tom writes, including the Wilburys stuff. He’s just a great, great writer. But I can’t speak for how Tom does it. In my case it’s just write another one, write another one, write another one, and keep the muscle flexed. Then when you finally get something that jumps out at you, you know when it’s good. The riff for the Stones’ Satisfaction came to Keith Richards in a dream. Have there been any songs that arrived like a gift for you? The closet one is probably Hollywood Nights. I usually have a guitar or a keyboard nearby. It’s very seldom that I’m driving in a car and something rolls into my head, but that song did. I was out in Los Angeles and I was just beginning to record Stranger In Town. I had a house out in the Hollywood Hills. I could see the city from my house. I’d be driving up there in the Hollywood Hills, just driving along, and then suddenly: ‘Hollywood nights, Hollywood Hills, above all the lights, Hollywood nights’. It just came right into my head. So I turned right around and drove home, and I’m singing this in my head thinking: “Don’t forget it, don’t forget it! Don’t turn on the radio!” [laughs]. I get home and I sing it into my little cassette recorder. Okay, that’s a good start. It’s high energy and it’s gonna be fun and the girls [Laura Creamer and Shaun Murphy] are gonna sing it like crazy. I’ve been singing with these gals for the last 38 years, ever since Ramblin’ Gamblin’ Man and they’re gonna nail it. That was one that came out of nowhere. Many songwriters say that writing a rocker is much more difficult than writing a ballad. It is. A song like Rock ‘N Roll Never Forgets is just slammin’. When we play that song live people go nuts. At that point in my life I was 31 years old. And the first 10 or 11 years in my career I was making six, eight grand a year [laughs] and just doin’ it because I loved the music. Jimmy Iovine [producer] used to tell me: “The hardest thing to find is a rock’n’roll hit.” I said: “Really?”. He said: “Think about it. If an artist is looking for a hit, they put out a ballad”. I’ve had hits with rockers and ballads. I think writing a rocker might be harder because it’s so familiar for us. When you’re a rock act and you go out and play at night, maybe you take those rockers for granted. I said to my friend Kid Rock: “What’s the hardest song for you to write?”. And he said: “A good rap song, because I’m so close to it. It’s very hard to write something that sounds fresh. How do you remain connected with your audience? It’s just me. It’s the way I am. It’s my sensibility. It’s what I like. I love rock’n’roll. I love the Stones; that’s what it sounds like to me in Wreck This Heart. If anybody compares me to the Stones that’s the biggest compliment in he world. I’m channelling the Stones a little bit there on that song. I have these influences that are just me. On Simplicity it’s a total R&B song. As I get older I get more and more plain-spoken in my lyrics and more to the point. Everybody loves a good metaphor, but sometimes they can get in your way and make things too cloudy. Billy Joel has spoken about how some songs grow up to be doctors and lawyers and some turn out to be bums. Are there any examples of songs of yours that fit that description? I’ll tell you a song that Don Henley really likes of mine and nobody ever played it on the radio. When I played it for him it knocked him out. It’s a song called The Ring. I think it’s on my album Like A Rock. It’s a six- minute ballad and it deals with a specific subject matter about a failing marriage out in a rural area and the restlessness that is setting in. The marriage has gone to pot and the ring doesn’t mean anything any more and they’re trying to hold it together. The characters are very sharply drawn. Nobody ever played it on the radio but I love it. Living Inside My Heart is a sleeper. Yeah. And another one is Somewhere Tonight. I wanted so bad to put Living Inside My Heart on my Greatest Hits, Volume 2 record and I fought and fought and fought. My manager said: “No, that’s a movie song.” I said: “No, I want it on there.” It’s beautiful. I was so bummed when they wouldn’t let me put it on there. I was actually working on my new album and let that one slide, and I wished I had worked harder on that Greatest Hits, Volume 2 package because there were other songs that I really wanted on there. Wrapping up, let’s run through some of your best- known songs how they came to be written, starting with Turn The Page. I never thought that song would last as long as it has. That’s one of the songs we must play or people get very agitated. If we don’t play that the fans are definitely disappointed. That song captured something. I wrote Turn The Page in 1971. It was the eight or ninth year of that 10-year period where I was going nowhere fast. We’d been harassed at a truck stop in Wisconsin at two in the morning by some salesmen who kept calling us “girls” because we all had long hair. So we left because we didn’t want to get into a fight and become some police report. The next night I’m sitting there singing: ‘On a long and lonesome highway, east of Omaha. You can listen to the engine moanin’ out it’s one-note song… Well you walk into a restaurant all strung out from the road. And you feel the eyes upon you as you’re shakin’ off the cold. You pretend it doesn’t bother you but you just want to explode….’. I was thinking about how these people hate you because of the way you look, and how unreasonable it is. That became part of it. But the bigger thing, I think, was the real weariness of the road, and I tried to capture that. I think I captured it for truck drivers. I think I captured it for travelling businessmen. And I think I just captured it for people who have to travel a lot and just plain miss home or family or both. Back then I used to joke we were more truck drivers than we were musicians; truck drivers moonlighting as musicians [laughs]. Me and the guys in the band were driving over 100,000 miles a year. Metallica recently covered that song. I liked Metallica’s version of Turn The Page. I thought they did a nice job of it. I especially liked the drums on it. I liked the different approach on the drums. That’s kind of like Turn The Page. It’s an exasperated song. It’s like: “I’m never gonna make it, I’m just gonna go to Katmandu” [laughs]. I’d always loved the group Little Feat. They were on Warner Brothers, and that’s why I wanted to be on that label. I was on the label for two years. Since then I’ve bought the catalogue back from them. Talk about getting lost in the woods. They had so many acts on the label that you just got lost in the shuffle. I felt like a number. Katmandu waswritten at the end of that nine-year or 10-year period where I was going nowhere fast. Glenn [Frey] and Don [Henley] told me that the Beautiful Loser album was the first little step in the right direction for me. Then the nextstep afterthat was Live Bullet, which was a huge step. And the next step was Night Moves, which was an even huger step. By 1980 both records were at six million, and they kept selling continuously. Beautiful Loser was a transitional album, and in the song Katmandu I still had some of that defeatist mentality and you can hear it in there. Just like Night Moves, that song rings true. What do they tell you about writing? They say you have to write about what you know. I grew up near that street corner. My older brother was a lot of trouble and I was not. My parents always called me “the good one” and they said: “You’re the one we can trust.” So at age 10, 11, 12 I was able to walk through Ann Arbor until midnight if I felt like it. There was a club, and this blues band from Chicago named Washboard Willie was playing there. In the window of this club there were people dancing, and occasionally there would be a beautiful girl dancing in the window. And at my age you were starting to wake up to girls. I would sit out there and watch through the window and listen to this great R&B. I’m looking and I’m listening and thinking this is what I wanna do with my life. The club was very lively, and to a 12, 13-year-old that was pretty cool. I loved the groove because it’s Chicago blues, and the women are dancing and you’re starting to think the women are looking pretty good [laughs]. So all that stuff ended up becoming the elements for the song Mainstreet. What do you remember about Feel Like A Number? I was real proud of that one. I was an auto worker for a brief time. I worked for six months making GM transmissions in Ypsilanti, Michigan. I lasted six months there loading conveyors. Then I worked at another plant on an assembly line putting rubber around windshields. Which is not good for a guitar player [laughs], so I didn’t do that for very long. I think I only lasted a month there. But I was there long enough to get it into my head that you can become just a number, you’re just a statistic; you’re not really a person, you’re just a cog in a very gigantic wheel. And it felt very uncomfortable to feel that way about myself. I tried to convey that in the song. Lastly, what about Old Time Rock & Roll? Old Time Rock & Roll came to me at the very end of Stranger In Town. All I kept from the original [written by George Jackson and Thom Jones] was:‘Old time rock and roll, that kind of music soothes the soul, I reminisce about days of old with that old time rock and roll.’ I rewrote the verses and I never took credit. That was the dumbest thing I ever did. And Thom Jones and George Jackson know it too. But I just wanted to finish the record. I rewrote every verse you hear except for the choruses. I didn’t ask for credit. My manager said: “You should ask for a third of the credit.” And I said: “Nah. Nobody’s gonna like it.” I’m not credited on it so I couldn’t control the copyright either. Meanwhile it became a Wendy’s commercial because I couldn’t control it. Oh my god, it was awful! This article originally appeared in Classic Rock #102.